I bought a car! Well, more accurately I financed a car, and my mom gave me the down payment as my graduation gift. When my mom told me she was giving me a car for graduating college, I was super excited, but honestly I didnt really believe her. At that time, I didn’t have a job lined up, and therefore saw no need for a car. She had more faith in me than I did. Then, I got a job in a suburb 20 miles from my house and BOOM. A car became necessary. 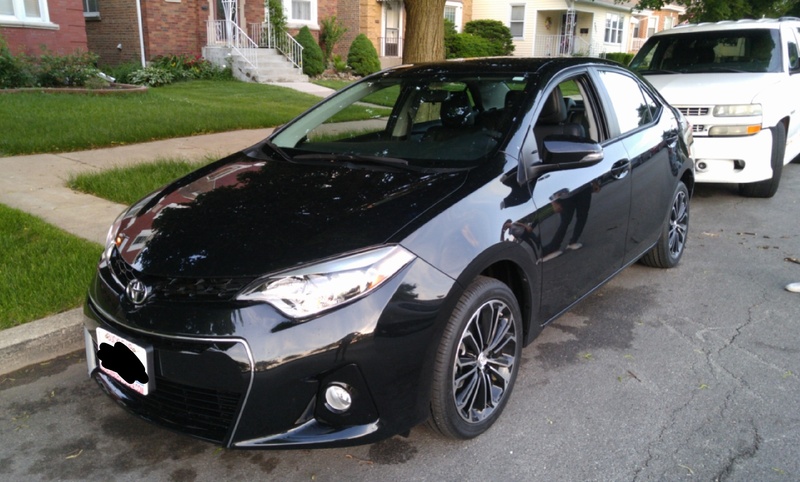 My mom has driven a Toyota Corolla since I was 7, and I knew that’s what I wanted, too. That’s about all I knew, though. How soon do I have to get insurance? What’s an average down payment? Can I get a grad discount? So, I set aside a few hours and did a LOT of research. Roomie and my mom helped me out and gave me a couple starting points in terms of price and insurance stuff. The next thing I did was check two different financing services to see which would give me a better deal. A good deal has low to no interest rates, and doable (preferably low) monthly payments. The two places I checked were Capital One and Toyota Financial services. My mom went through Capital One when she bought her car. Basically the way it works is you fill out their application, and if you’re pre-approved, they give you a check for a certain amount. You bring the check to an eligible dealer, buy your car, and make your monthly payments to Capital One. When I applied, I was denied. I assumed it was because I’ve only been at my job for a week, but they didn’t give me a reason. That left me with Toyota Financial Services. (There are other places, but this was just the way I went.) This is the entity that creates those great deals you see in car commercials. “72 months for 0.9% APR!” The way these interest rates are determined has a lot to do with your credit. If you have a really high credit score, (my dealer said 750-800, but I’m sure it varies a bit) you automatically get 0% interest over 60 months or less. This means the price you agree to pay the day you buy your car is actually how much you’ll have paid when all is said and done 5 years later. Any interest rate above 0 means you are paying more at the end of your term. Thankfully, I have good credit, so 0% interest for me! Next up was insurance. I’m not sure if this is true everywhere, but in Illinois, the law require that you have auto insurance before you drive your car off the lot. My mom told me to get a quote from Geico. It literally took 10 minutes, and if I had purchased right away, maybe 15. Those commercials are no joke. Unfortunately, I didn’t purchase right away, but I was still able to do it quickly when I was at the dealership. Fun fact, even if you’re insured for a different car, your policy will cover the car you buy for up to three weeks (again, in Illinois), so you don’t have to get a new policy, or updates yours right away (but you should.) This is what I did. When I set up my insurance, it initially covered my mom’s car, because it’s registered to our home address, and that’s what popped up. It was an easy fix, though. I just called Geico the next day, removed her car, and added mine. (I could have also done this online, but I like to make sure everything is processed quickly and correctly.) My payment went up by like $30, but it wasn’t bad at all. The other option was to add another car and driver to my mom’s insurance, but we didn’t do that. No particular reason why. Finally, after all of that, I had to go get my city sticker. Luckily, that was super easy. I just went to a currency exchange with my registration and bill of sale (and my driver’s license just in case), and asked for city sticker. The dealership takes care of the license plate and plate sticker when you get your car. And voila! My baby was ready to go! Do your research! What kind of car, cost, financing options, etc.? Also, factor in gas, maintenance, and anything costs you can think of. The responsibilities of a car do not end at the car note. Make sure you have a city sticker and any other documentation necessary for your area. It helps a lot if you have good credit. Alright, that’s all for now, because I’m sleepy. Nice article, hope you enjoy the car. Glad to see you take your time and did all the necessary things before jumping into it. I can’t stress your first tip enough though: do your research!